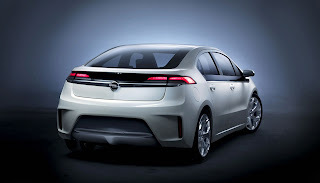 Following the leaked pictures of the Vauxhall/Opel Ampera, these are the first official images of the Ampera, a plug-in electric hatchback that will go on sale in the UK in 2011. 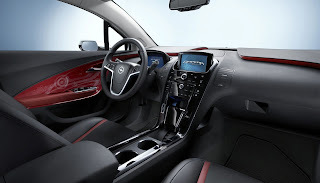 To be unveiled tomorrow at the Geneva show, the new model will sit between the Astra and Insignia in Vauxhall’s/Opel's line-up, have a range in excess of 300 miles and be capable of recharging from a standard 240V household plug socket. 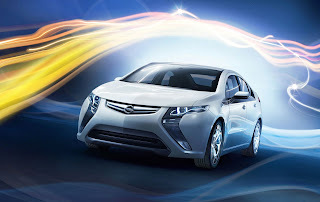 The Ampera is the Chevrolet Volt European sister car and will be available in the UK in right-hand-drive form in 2011. The Vauxhall differs from the Volt with a new front end that features dramatic styling cues from the firm’s recent Flextreme and GTC concepts. The nose is dominated by twin air intakes either side of the grille. The headlights are also new, featuring what looks like LED technology. At the rear, there’s a redesigned lower diffuser and bumper but apart from that, the Ampera’s 5 door body is identical to the 4 seater Volt. The technology that lies beneath, called Voltec, is also donated by the Chevrolet. The Ampera features more than 220 lithium-ion batteries arranged in a T-shaped pack under the rear seats. 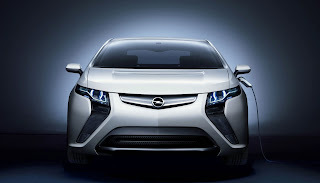 These power an electric motor that drives the Ampera’s wheels at all times. For journeys up to 40 miles, electricity is supplied by energy stored in the 16kWh battery pack. When that runs out, a petrol or biofuel-powered engine – likely to be a small 1.4-litre unit from the current Corsa, which will run at low revs – kicks in. This acts as a generator, and provides electricity to power the wheels while simultaneously charging the battery. Vauxhall says this extends the range of the Ampera by another 200 miles, until the owner can recharge the battery via the mains. The Ampera boasts performance figures similar to the average family car, with a 0-60mph time of around 9 seconds and a top speed of 100mph. According to GM bosses, it’s entertaining, too. “Driving electrically is not only about ecology, it’s also great fun,” said chief engineer Frank Weber. “Instantaneous torque of 370Nm means it feels like a sports car.” Dimensions of the new vehicle are; length - 4,404mm, wheelbase - 2,685mm, width - 1,798mm and height - 1,430mm. Cargo volume is around 301 litres. Vauxhall claims that the Ampera will be ideal for most European buyers, as it estimates that the vast majority cover less than 30 miles a day. The firm also claims that unlike conventional battery-electric vehicles, the Ampera eliminates ‘range anxiety’, as the driver knows that he or she will not be left stranded by a flat battery. 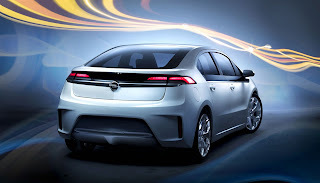 “The Ampera demonstrates GM’s leadership in the electrification of the automobile,” said GM Europe president Carl-Peter Forster. “It uses the kind of technology the car industry needs to respond to energy and environmental challenges.” Vauxhall is aware that there are problems to overcome before the Ampera reaches customers. It is currently working to ensure the lithium-ion batteries are fully developed and is consulting with energy companies, including Spanish concern Iberdrola, parent firm to Scottish Power, on a recharging infrastructure for plug-in electric cars. 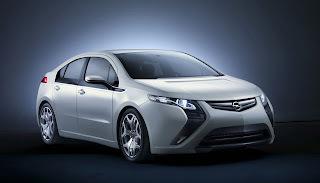 No prices have been rumored but the Ampera is set to cost significantly more than the forthcoming Astra.